‘As regal as a queen by day, as wild as a leopard by night”: The exuberant, exotic and almost impossibly glamorous Josephine Baker streaked across the cultural firmament of the early 20th century like a beautiful bronze meteor. That, certainly, is the approving verdict of history, though like many a bold and unconventional person, Baker has had her detractors. 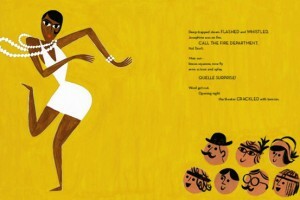 Young readers will get a bracing sense of the force of personality behind the famous name in “Josephine: The Dazzling Life of Josephine Baker” (Chronicle, 104 pages, $17.99), written by Patricia Hruby Powell. This attractive volume has the physical heft of a novel, but with its rollicking prose and Christian Robinson’s vibrant illustrations—all in the service of an extraordinary life story—the overall effect is of a picture book that simply will not quit. This quality perfectly suits the woman celebrated in these pages, a saucy and determined individual who rose from abject poverty in 1906 St. Louis to command adoring audiences across Europe during the Jazz Age. She would later not only spy for the Free French during World War II, writing secrets on her sheet music with invisible ink, but also adopt a dozen children of different races whom she raised in a French château. Flashing a gorgeous smile, crossing her eyes and shimmying like fury, Baker was a sensation, and we rejoice to see her in Mr. Robinson’s autumn-hued, naif illustrations. It is a shame, however—if perhaps unavoidable—that he chose not to depict even a version of the famous Paul Colin poster that introduced Baker to Parisian audiences; the placard has a retrograde, minstrel-like feel, it is true, but surely children ages 8-14 who can read about the 1925 poster could also be trusted to look at it. Three books in different genres about Josephine Baker have been published this year: Josephine by Patricia Hruby Powell, a novel, The Spirit of Josephine by Florence Ladd, and a biography, Josephine Baker and the Rainbow Tribe by Matthew Guterl. They deserve notice as evidence of a revival of Baker’s inspiration and enduring importance as a cultural influence.